I don't do a great deal of stitching but I always fall back in love with it when I do. 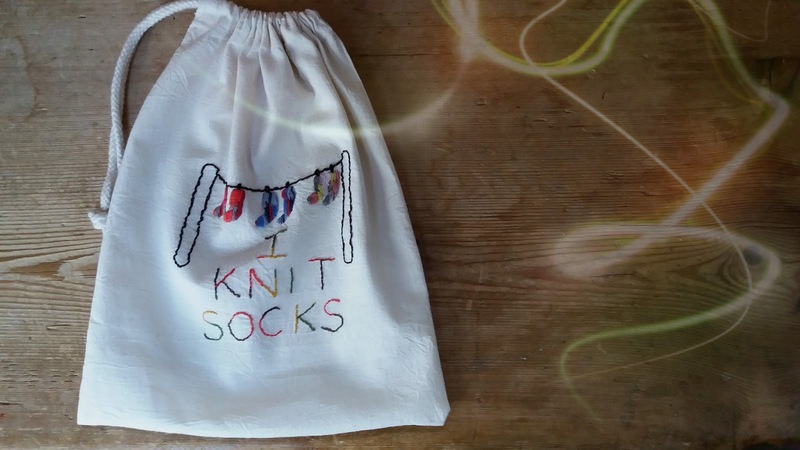 This little project bag was a perfect way to fall in love all over again. The threads and drawstring bag are from DMC given to me at the CHSI show back in February. The colours play out as you sew. The design is drawn onto a sticky fabric called Magic Sheet which is temporary by washing it off at the end. Draw your design, sew, wash and hey presto! your very own piece of stitching design. My design was simple, nothing too intricate that would make me stuff it back under the sofa. I have a short attention span. I peeled the back off, stuck it to the bag and got stitching. The self colouring yarn was the inspiration for the self striping sock design. It is naive but I like it. It washes off and then I gave it a final press. Ready to fill with a sock knitting project. What a good idea and a lovely sock knitting bag. Thats lovely. great idea to use the stabiliser. Yay, your bag is lovely. 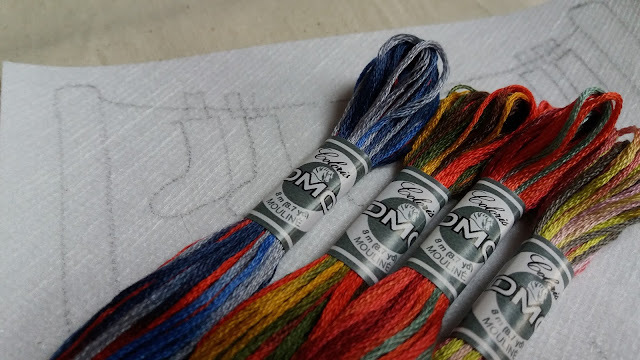 What a cute way to use the variegated thread. The magic sheet is cool stuff isn't it? 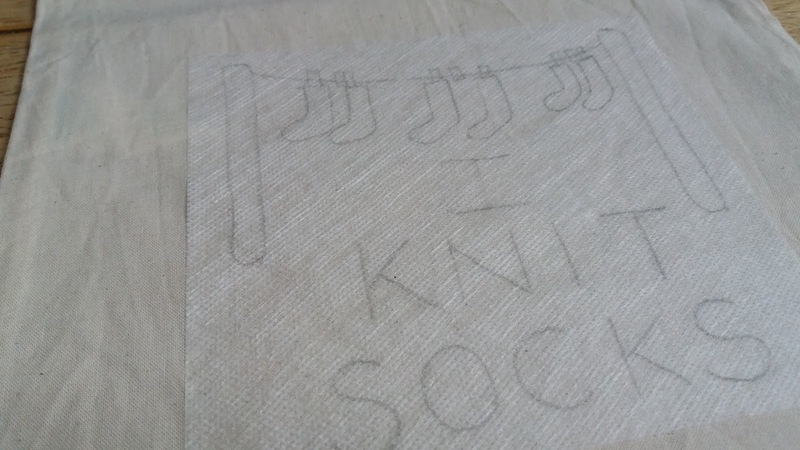 On a side note I need to add sock knitting to my 'one day to do list' Did you see the clever balls of wool that knit up as a pair of matching striped socks without you have to change a thing? I NEED to try that! What a cute little bag. 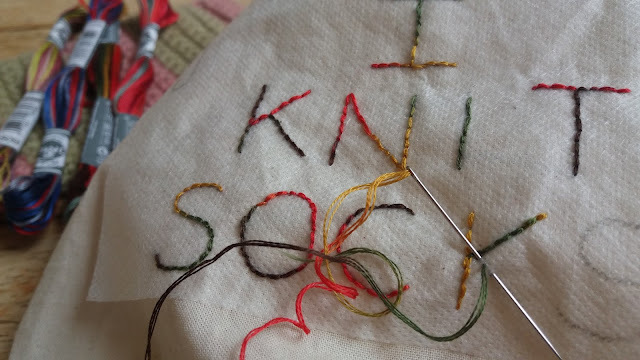 I love the embroidery thread you have used, I haven't seen it before. 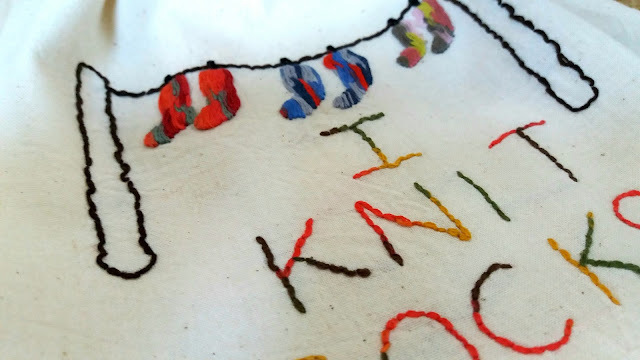 Simple embroidery can be really effective, although your line of socks looks quite tricky to me. Magic sheet used to jut come printed with designs but you can get it blank which is so much better for me. A great bag, Jo. I'm very intrigued by that magic sheet, I have to give it a try. I love this. 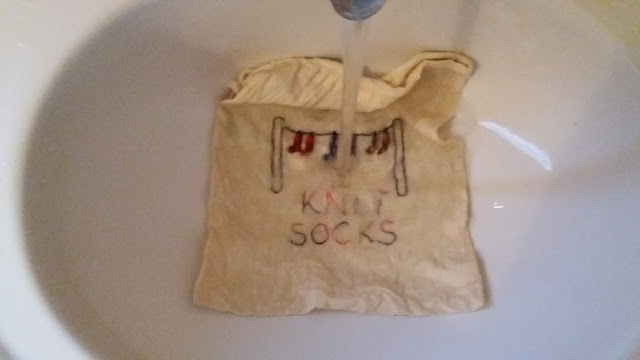 It's the perfect little sewing project which also has a use, rather than needing to be hung somewhere. And that washable magic sheet is interesting, I've never used that before.